Three British cult television shows, Doctor Who, Merlin, and Downton Abbey, had special episodes for the holidays. Doctor Who: The Snowmen aired in the United States later the same day, but the fifth season of Merlin and third season of Downton Abbey have not and therefore this post will contain major spoilers. I will precede the discussion with the later two with a picture from the series to allow those who do not want to see these spoilers to turn away. I will discuss Merlin second as the spoilers will not be as shocking to those who can predict where the story is heading based upon the Arthur legends. The events of Downton Abbey would be more of a surprise. By now I wonder if there are there any Downton Abbey fans who are waiting for the US airing who have avoided hearing about the two shocking events of the regular season and Christmas episode? If so, they should either download the season now and watch it quickly or stay off the internet and stop reading newspapers and magazines until they see the entire third season. 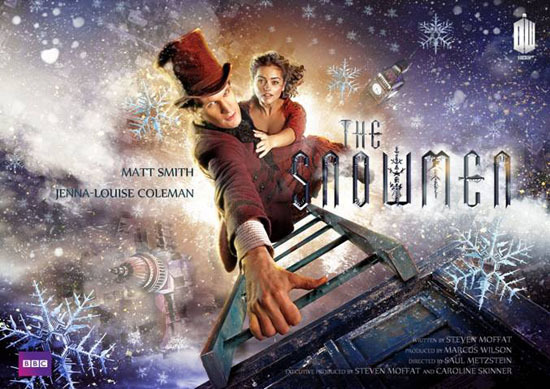 Doctor Who: The Snowmen contained two main story lines. The main plot of the story dealing with the Snowmen and the villain of the episode were not all that significant, unless the reference to the Great Intelligence foreshadows a future aspect of the storyline as opposed to references to a couple of old episodes from the 1960’s (which did include havoc in the London underground). The Snowmen‘s real importance was in reintroducing Clara (Jenna-Louise Coleman), first seen as Oswin Oswald in Asylum of the Daleks. 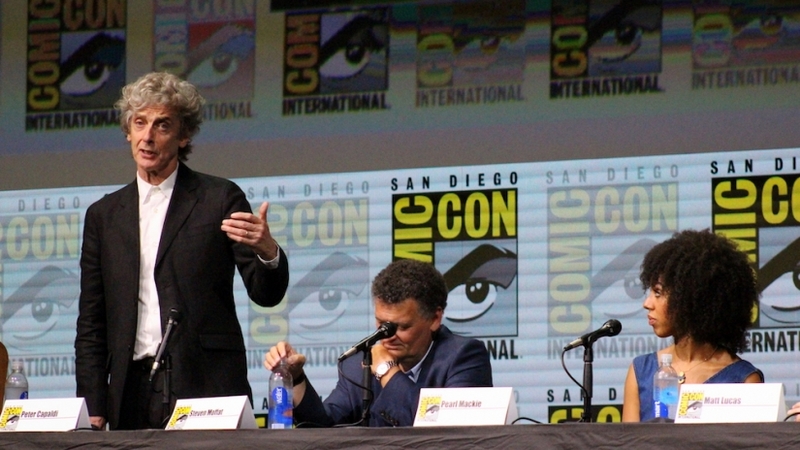 Not surprisingly, there was some misdirection from Steven Moffat and Jenna-Louise Coleman, who did not answer questions about her role with the full truth in recent interviews. One highlight of the episode was Clara’s first view of the inside of the TARDIS, after climbing up stairs into a cloud for a second time. Her response was a first: “It’s smaller on the outside!” Her next question was also a first, and confirmed her connection to Oswin Oswald, when she asked if there was a kitchen inside because she likes to make souffles. Clara earlier had the right word (Pond) to get the Doctor’s attention. Most likely this was thrown in for the viewers, but perhaps knowing to say this is another sign that Clara is not what she seems. If there was any doubt from the souffle line that both of Coleman’s characters were connected, this was answered at the end. The souffle girl died a second time, still leaving her well behind Rory in number of deaths for a companion. Her tombstone read Clara Oswin Oswald. Her final words to the Doctor were the same in both The Snowmen and Asylum of the Daleks: “Run, you clever boy… And remember.” The Doctor showed he planned to do just this, seeming to give Clara Oswin Oswald as the destination to the TARDIS. The episode ended with a girl also played by Jenna-Louise Coleman in modern times visiting Clara’s grave. 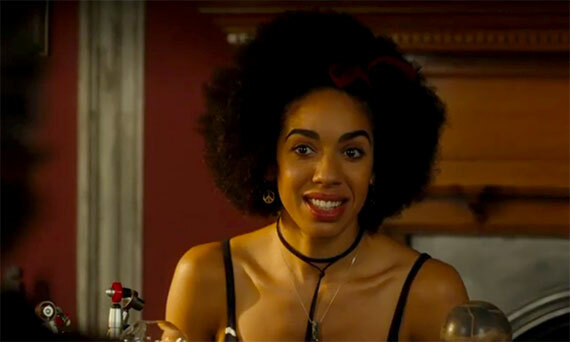 Moffat has launched another mystery with this girl who, somewhat like Timelords, can die and yet remain alive, except in her case still look the same. The final season of Merlin was mixed in quality, but the final three episodes, including the two-part story Diamond of the Day, were excellent. Merlin concluded as the Arthur stories conclude–with Mordred delivering a mortal blow to Arthur. Like Morgana, who was not shown to be evil until the third season, Mordred was not portrayed as a threat to Arthur until he was given reason to turn against Arthur in the final episodes. Diamond of the Day Part I concentrated on the final battle, which concluded early in Part II. The final episode showed the deaths of Mordred and Morgana, but primarily dealt with Merlin and Arthur in what turned out to be the final hours of Arthur’s life. Merlin and Arthur had the conversation which would have been expected to occur long before as Merlin revealed that he is a sorcerer. Fortunately for the legend of Merlin, Gwen figured out the identity of the sorcerer who led them to victory, presumably leading to the legend of the bearded wizard who aided Arthur as opposed to stories of a young servant. Before it became clear that Merlin was to tell Arthur’s story until its conclusion, I wondered if the entire series was to be about Merlin and Arthur in their youth, taking place before the greatness of Camelot. Seeing how the series did end, I do wish that during the final season they had done more to show why Arthur was a great king, worthy of being remembered in legend. The final season, which was the only one to show Arthur as King, just didn’t show Arthur’s life to be as significant as it was foretold to be in earlier seasons. Regardless, it was sad to see Arthur die, but we were promised that Arthur would return when needed. For now, Long Live the Queen, as Guinevere took over for Arthur. 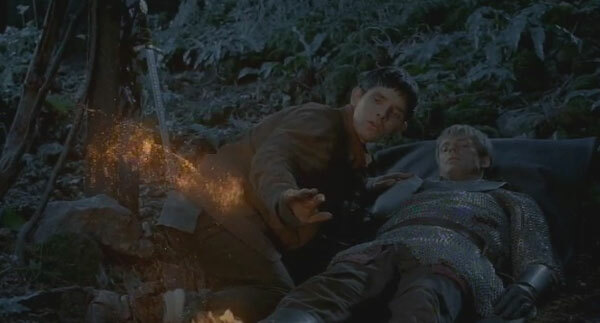 I would assume that Merlin would remain to assist her, and we saw at the end of the episode that he remains alive today. The deaths this season on Downton Abbey were more shocking than the deaths of Clara (which may not be permanent) and of Arthur (which was anticipated). This is a reminder that major spoilers are coming for those who have not seen the third season yet. The news media stories that Dan Stevens (Matthew) would not be returning for the fourth season were true but the reports that he would return for the first episode only appear to be misdirection. 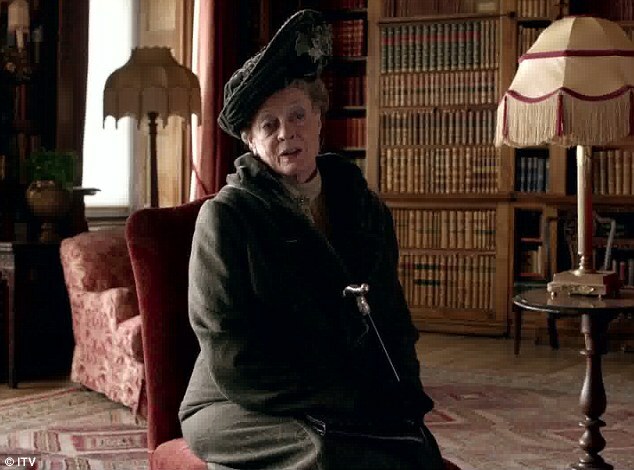 Maggie Smith, in the scene pictured above, foreshadowed Matthew’s death when she said “we don’t always get our just desserts. The scene was interspersed with scenes of Matthew driving (and looking careless) following the birth of his son. 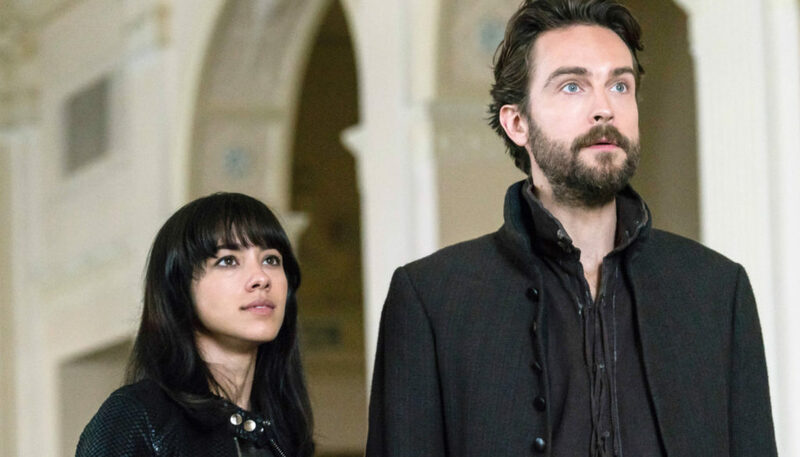 It turns out that Dan Stevens had decided not to return for a fourth season even before filming began for the third season. 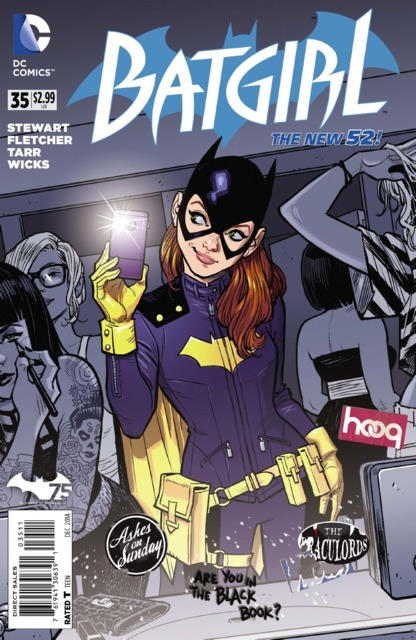 Stevens said, “We were always optioned for three years.” At that time it is doubtful anyone would have predicted how successful the show would have become, leading to a fourth season. He If he had to leave the show, the season did wrap up Matthew’s story line well. Matthew saved Downton financially earlier in the season, and the importance of his actions was emphasized in the Christmas episode. 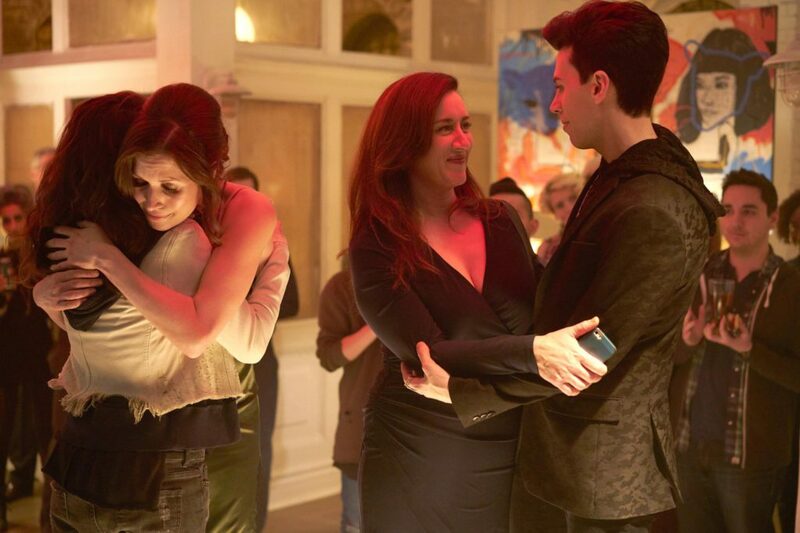 There were also happy moments in the episode, as Mary and Matthew had a son. In retrospect we were also told that Matthew’s role in the series had ended as Mary described this as the two completing their jobs, providing a heir for Downton. There will now be two children at Downton lacking a parent. Tom Branson still isn’t completely comfortable in his role, but he has become part of the upstairs cast following the death of Lady Sybil earlier in the season. Branson, and a new maid, did learn the social implication of his new role in this episode. It does appear that one new character might be added to the cast. Like the original Upstairs, Downstairs, a young and wilder niece (who already visited earlier in the season) is coming to live with the family, and might open up potential new story lines. With Downton Abbey you can’t predict if this will be a permanent edition, or just a brief visit from someone who will soon be forgotten as with Shirley MacLain’s character in the third season. 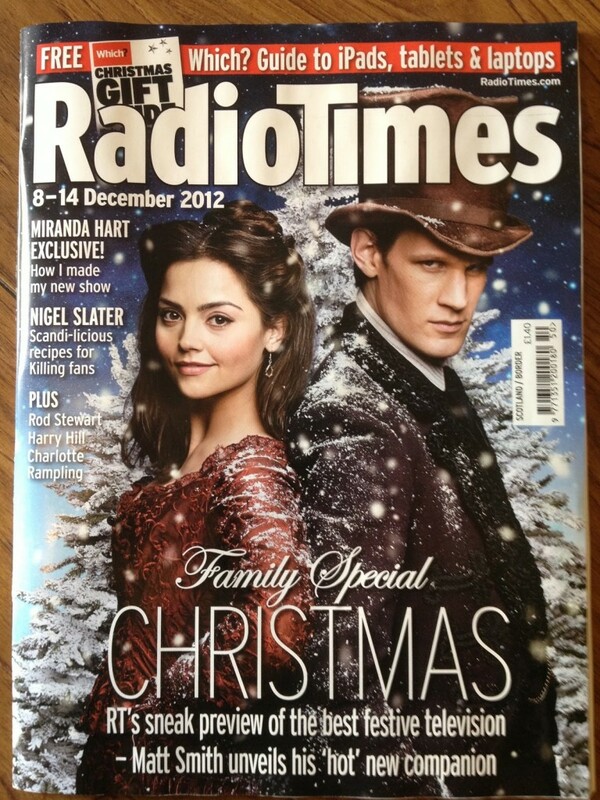 Radio Times has The Snowmen on their cover. Blogtor Who reports that the article quotes Jenna-Louise Coleman as saying, “I’m not Oswin: I’m a different person who looks and sounds like Oswin.” Could it be that there is no connection, or is Moffat dragging out an explanation? If at some point we find out that Clara gets duplicated, don’t get too attached to the copy. Same goes if we meet a descendent of Clara’s who looks a lot like her. So, you played an ultimately deceased Dalek on that show and now you are about to debut (again!) on the special Christmas show as the Doctor’s assistant. All of which obviously raises about a thousand questions. Is this a subject that is going to be addressed in the Christmas episode? Uh… mmm… no. We’re going to have what has been referred to as a “soft mystery.” For me, filming, I’ve been totally oblivious to Oswin and the “Asylum of the Daleks.” I really have had to erase it from my memory. Yeah, Christmas is it’s own episode. Oswin was a Dalek. Can you tell us whether your companion is human? Not all of the Doctor’s companions have been. That’s why it’s so difficult [to talk about it]. Because of the way it started with Oswin, it’s really difficult to say much: where she’s from, what period she’s from, what planet she’s from, even. It’s not often an actor can’t even reveal what planet their character is from. Exactly, yeah. I know. Doctor Who’s the worst for it, isn’t it? The BBC has announced that Merlin will end after the fifth season, which is currently being aired in the U.K. I will try to avoid giving away too much for those waiting for the season to air in the United States but there will be some spoilers here. I had thought that the entire series was to be about younger versions of Merlin and Arthur, taking place before the major occurrences of the legends. Now it appears the series might include the entire Arthur story. The final season is in some ways more like the King Arthur legends except that this still seems earlier in the legends than might be expected at the conclusion of the story. Mordred plays a part in the final series and based upon released synopses of upcoming episodes we do appear to be heading towards their final confrontation. The video above contains an interview with Colin Morgan. There is also talk of a spin off series taking place in this time period. Production on Sherlock has been delayed so we will have to wait until late 2013 to see how the cliff hanger is resolved, with the third season not airing in the United States until late 2013 or 2014. 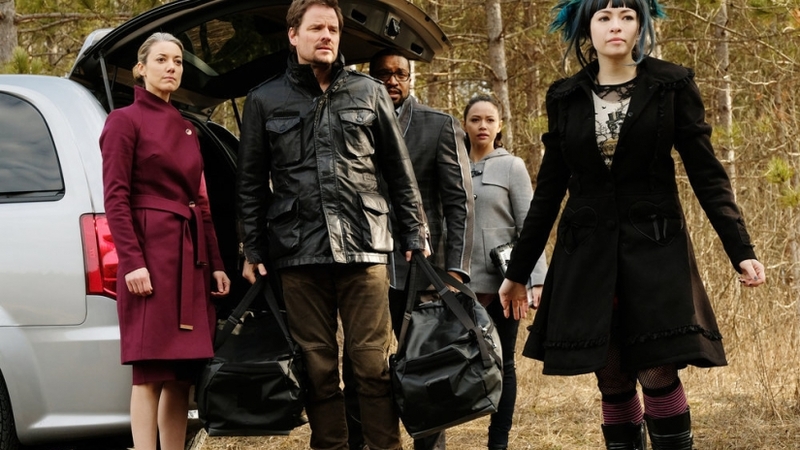 Revolution wrapped up the first half of the season. The mid-season finale was disappointing, but this came as no surprise based upon how the series has been written to date. 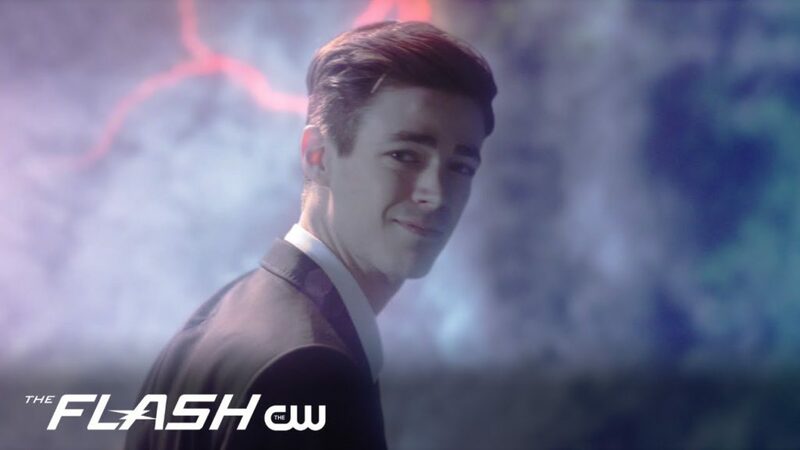 The entire first half of the season consisted of an arc in which Rachel’s son was captured and it came as no surprise that the arc ended by freeing him. The contrived suspense of whether Miles would rejoin the militia, which began in a flashback the previous week, ended as expected. What could have been a surprise at the end of the episode, a helicopter in the air, had been given away by scenes of the helicopters in the preview. Even if Rachel had really built a working amplifier, could this really support helicopters going an distance? I suppose they also quickly invented some sort of receivers for the helicopters so that they would have power but there wouldn’t be electricity for everyone else around. ENTERTAINMENT WEEKLY: Was there ever a version in your head where Miles goes, “Yeah, I’m re-joining Monroe”? Eric Kripke: What we love about Miles is half of him is light and half is shadow. If this story was set a couple years ago he would be the bad guy. You never want to lose sight of that. 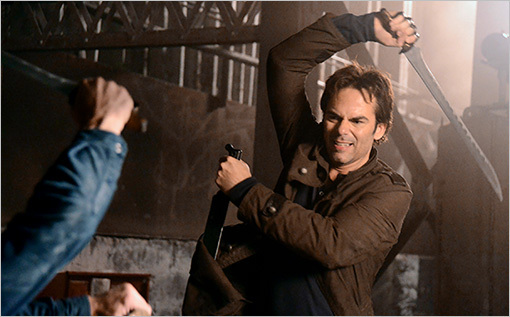 Just because Miles was able to face-off with Monroe in this particular encounter and maintain the heroic side of his personality doesn’t mean it’s going to happen again. So even though he was able to resist the temptation, that temptation is still there. Even moreso when he starts to fulfill his destiny and becomes a leader for the rebels [in the second half of the season]; he starts to fall into his old bloodthirsty patterns again. 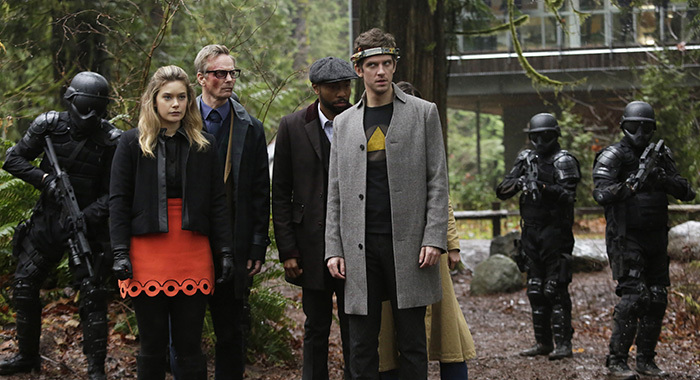 … There’s also a lot of important pieces in last night’s episode that move the story forward. We’re setting up how pissed Monroe is going to be in the second half of the season; how personal Neville is going to take Miles’ assault on his wife. And [we hinted that] Rachel and Miles have a very secret history. I gotta ask, since I’m seeing this comment on the boards: How could Rachel forget to grab the pendant on the way out of the room? Kripke: We shot a scene where Rachel goes, “We have to go back and get the pendant,” and Miles says, “We can’t go back, they’re shooting machine guns at us!” We ended up cutting it for time because we thought, maybe wrongly, that when there’s a room full of five people shooting machine guns in your direction that you can’t run toward those machine guns. You mentioned the learning curve, what more have you figured out since the last time we spoke? Staging a revolution is a pretty big venture. Can you give us an idea of what specific characters will be focused on? Kripke: Charlie and Miles are really going to be focused on the war against Monroe. Miles leading the rebels gives them a fighting chance and Charlie is right beside him. Rachel and Aaron will focus the ongoing mythology in terms of revealing why the lights go out. I can reveal now that we do reveal it, now that we’ve written that scene. And reveal how to turn them back on. You’re not that deep into production on the second half of the season, so can we assume that revelation comes fairly early? Yeah in the second half it happens sooner than anyone is thinking it will happen. Revolution has been mediocre but has managed to keep me hooked by wondering about its back story. Knowing that their will be a revelation early has me hooked into starting the second half of the season, and once I start watching I’m likely to continue through the first season. Will they come up with enough to advance this story into a second year? My immediate thought on this: Gary Mitchell (Where No Man Has Gone Before). The above video is obviously from the original show and not the upcoming movie. 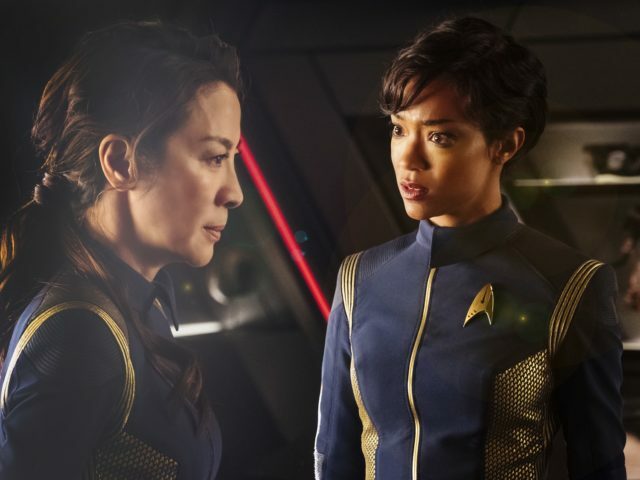 Last week’s installment of SciFi Weekend had some cases of shows having to carry on with the loss of characters. 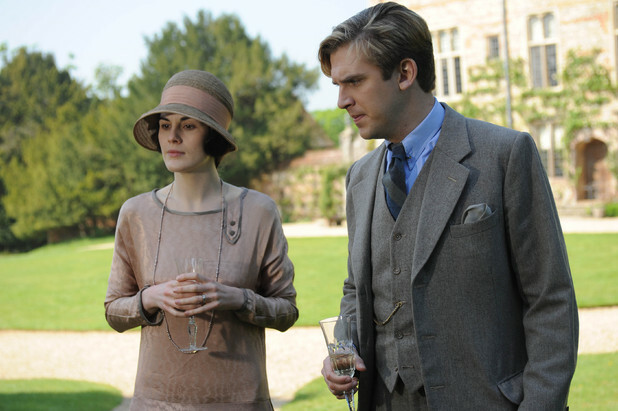 Now there are reports that Dan Stevens will only return for the first episode of the fourth season of Downton Abbey. His character, Matthew, takes on a prominent role at Downton in the third season (which has not yet aired in the United States) and I wonder if it will require a major change in direction for the fourth season if it is necessary to write him out. Perhaps more money will encourage him to stay, or at least make occasional appearances so that they can just say he is working in London for parts of the season. UNIVERSAL CITY, Calif. – November 27, 2012 – NBC and Universal Television have entered into a deal with Oscar, Emmy and Golden Globe Award-winning writer-producer Julian Fellowes (“Downton Abbey,” “Gosford Park”) to create and produce his next dramatic television series, it was jointly announced today by Jennifer Salke, President, NBC Entertainment, and Bela Bajaria, Executive Vice President, Universal Television.